A 3 day loop consisting of bits and pieces of: the Centennial Trail, paved and dirt roads and a portion of the Mickelson Rail Trail. I’m live in PA and was itching to do a little riding in the arid west for a change of climate. South Dakota became the destination because: a) I haven’t been there, b) relative lower elevations (max 7000′), c) interesting history d) point to point trails are well documented. Mickelson Trail 109 mile rail trail. I’m pretty much a paper map person. Prep includes downloading USGS DRGs, overlaying UTM grid, magnetic/true/grid north arrows and any other available data. 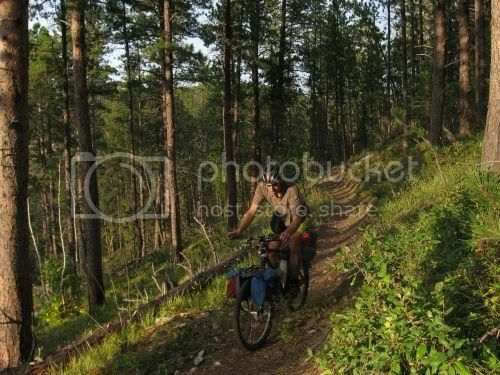 In this case, the Black Hills NF website had a SHP file with good data. Finally, I trace out routes, measure distances and create a waypoint file… and of course print out hard copies. A Google map with the Route, Background Info and linked pictures is here. The map is fairly cluttered–toggle stuff on and off to improve readability. 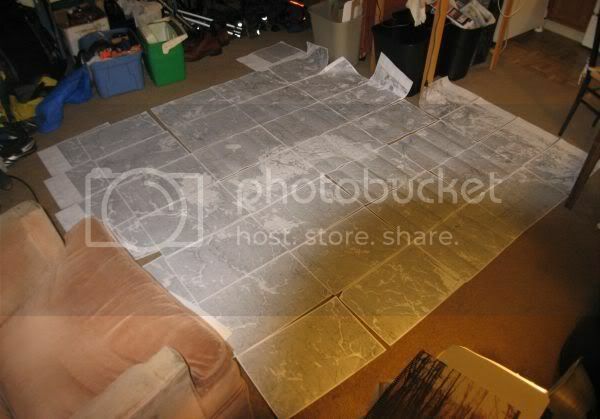 (The map includes some photos not included in this write up). 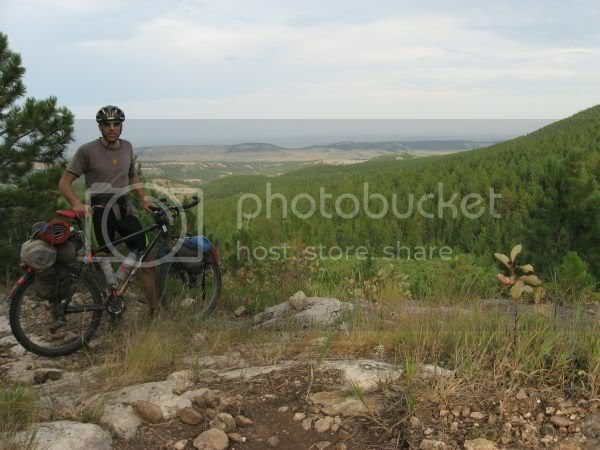 This trip was to be a bike tour combined with tourist type activities, so I limited the multi-day ride to 3 days. Part of the reason was I didn’t want to get in over my head and suffer…I’d rather enjoy the ride and the scenery. After the 3 day tour, I did a handful of day trip rides, checking out other trails and other segments of the Centennial as well as some hiking and tourist stuff (excursion train, museums, etc.) The Black Hills is something like 100 miles N-S and 50 or so miles E-W in which tourism plays a large role in the local economy–there is plenty to do and see in addition to the riding. I was surprised that it only took 1.5 days to drive the 1500 miles from Pittsburgh. I arrived in the Sheridan Lake area around mid-day on Labor Day Sunday and did a little scouting ride on the Centennial and decided on which trailhead to leave the car. Monday AM the ride started. Heading north from Sheridan lake, the trail goes through pasture. Some of the grass approached 4′ tall. Back home, one would be soaked from the morning dew, but in the dry climate, there was no dew to speak of. The Centennial is a mix of single track and double track blazed with those fiberglass posts…no blazes on the trees. 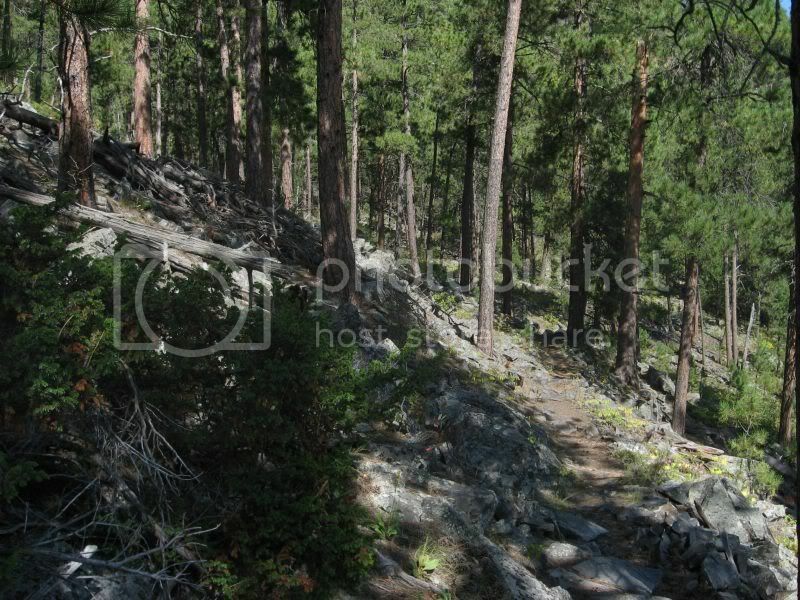 In most places the trail is easy to follow, but more than a couple times I wandered off the trail and had to backtrack. Climbing up to Pactola Dam I sort of wandered off the trail on a well worn cow path. Of course, one doesn’t discover navigational slip ups before you push up the mountain, but at least the view was worth it. The trail N Pactola Dam is a hoot. It stays at relatively the same elevation as it runs in out of the draws that lead to the lake. Continuing on, I stopped and took on a charge of water from a stream near the Pilot Knob Trailhead. Finding water was not an issue on this trip. There are enough streams and lakes around. From Pilot Knob the trail’s definition of ‘multi-use’ includes ATVs. I think that I came across maybe 6 ATVs in the 10? mile section that is shared use–pretty low for a holiday weekend. I stopped to chat with one group of ATVers. It seemed to be an extended family, riding in 2 of those utility ATVs (side by side). One young women in the group looked pretty fit, and was packing some big biceps, here it comes out she was a moto-cross racer (from Wyoming) who had competed earlier in the weekend at Steel City Raceway. Talk about a small world, I live about 3 miles from that race course and had ridden past it on the Friday night before my Saturday AM departure for this trip. One thing about this trail I found sort of unexpected was the lack of ‘informal campsites’. Either users are really good at ‘leave no trace’ or most users utilize the developed campgrounds along the route. I’m not really one for the developed campsites, so I eventually found a suitable place for the night. Day 2 started with another 20 miles or so of the Centennial trail. The highlight of this portion of Centennial is the descent into Bulldog Gulch. 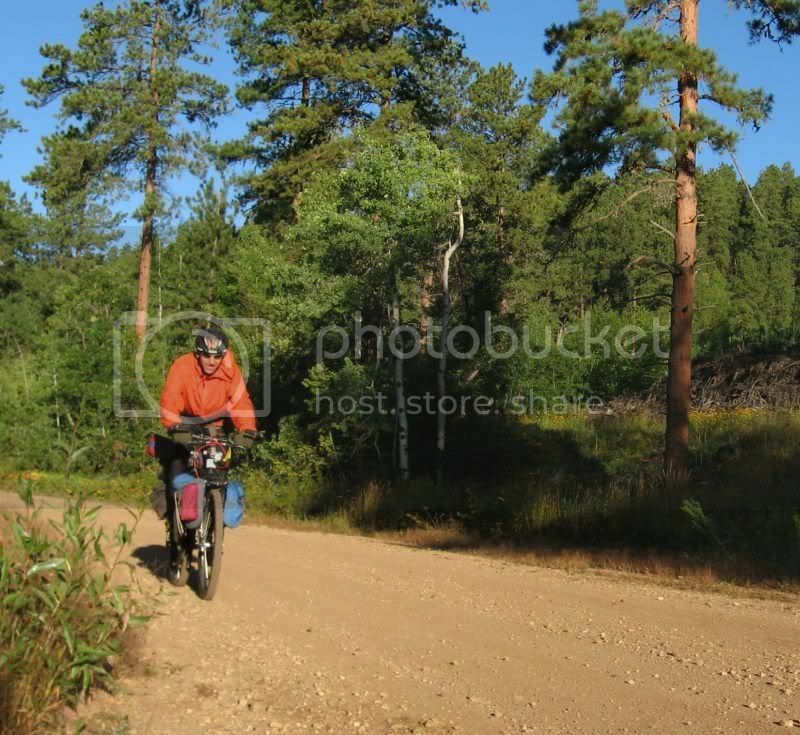 At the Fort Meade Trailhead, I broke off the Centennial and headed into Sturgis. Sturgis looks like a good place to get a tattoo or patronize a biker bar. I stopped at the grocery and at a sub shop and keep on moving. 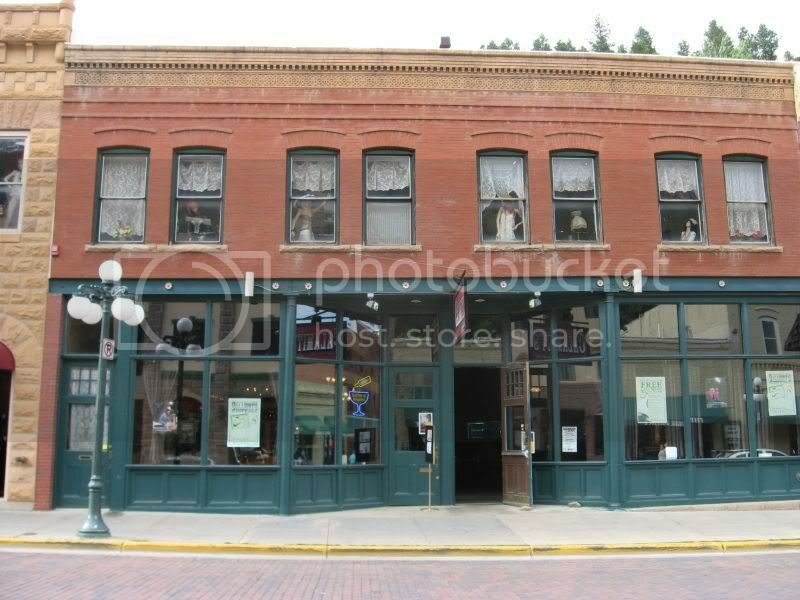 The next stretch took roads over to the twin towns of Deadwood and Lead. Deadwood is the terminus for the Mickelson Rail trail and also a place with a history steeped in the wild west. Gambling is the town’s lifeblood these days. Rather than jump on the Mickelson in Deadwood, I headed up to Lead and back into the forest and found a campsite. The overnight low temp and frost was a bit of surprise….and the brilliant morning sun was welcome. That is one thing I noticed. The sun out here is relentless. Hardly any clouds and the Ponderosa pines give weak shade which makes the sun seem even more intense. I rolled through Spearfish and checked out the town before taking the Spearfish Scenic Highway South and finally joining up with the Mickelson Rail Trail S of Deadwood. A rail trail? Well it was going my way and I’d rather loop than backtrack. As far as rail trails, the Mickelson seems to have A-1 scenery. I think it was about 40 miles of rail trail to Hill City, where I took paved roads back to the car. Lack of users. 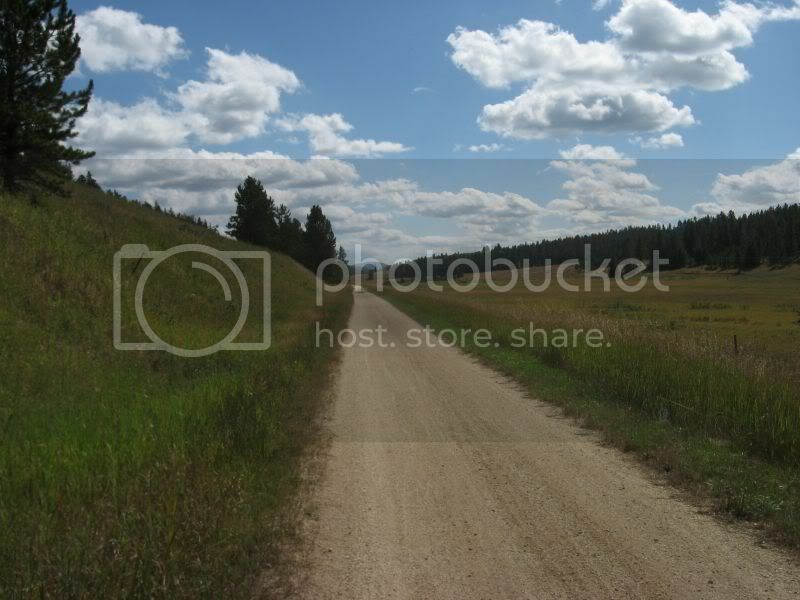 I saw 2 day hikers and the mentioned ATVers along the 60+ miles of the Centennial I road, nobody else on the trail. Mickelson had more users, generally retirees. Very nice looking city campground in Spearfish adjacent the fish hatchery and along a bike trail. Lack of ‘informal’ campspots as mentioned. Tree thinning. The active tree thinning in the forest kind gives the forest a open feel. In PA, we have to do the opposite of thining, deer consume so many saplings that areas need to be fenced in order exclude deer so that saplings can grow taller than the deer. 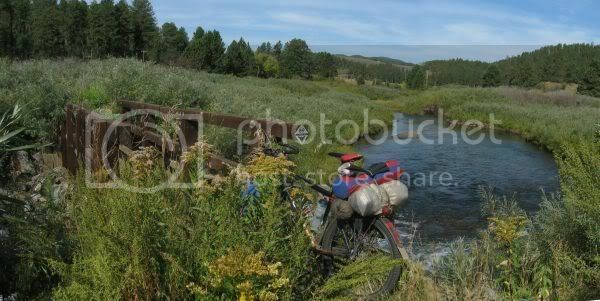 I enjoyed this ride and the trip to the Black Hills. When I read about the Centennial being multi-use, I was kind of unsure if there would be enough single track. My fears where unfounded. The relatively low elevation is helpful for us flatlanders not wanting to spend days acclimatizing. 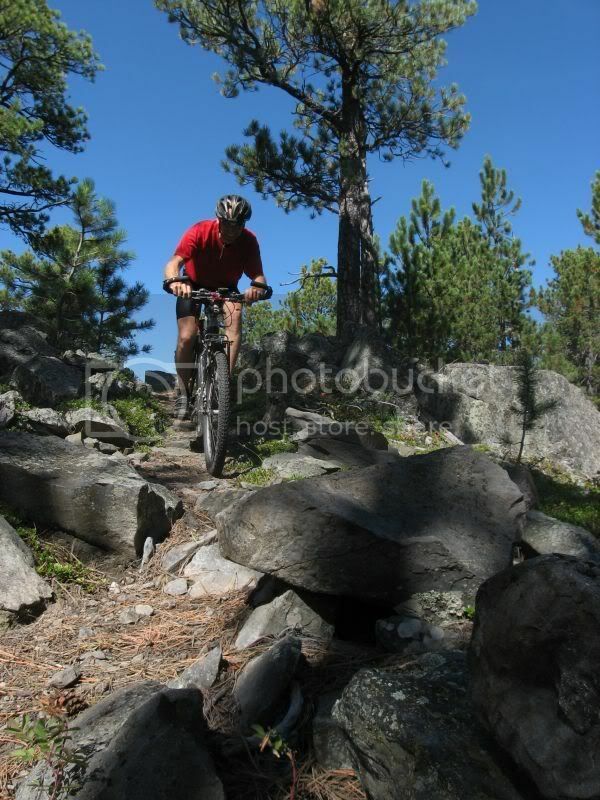 The Black Hills are kind of touristy, but it easy to get away from that type of activity. For day trip riding, there are some areas that have the stacked-loop type of deal. For those looking for a longer ride, an obvious option is to link the full Centennial with the full Mickelson. That was kind of my original thought (refer to the Google Maps and the detours around the Wilderness area), but then I backed off and decided to cherry pick what I though would be an interesting and varied route. In summary, I’d take another trip to the Black Hills. 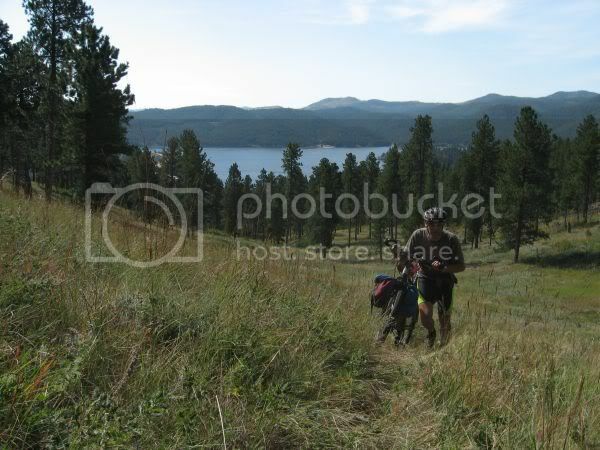 Here a couple of pics from Centennial trail of the portion S of Sheridan Lake. These section of trail was done as day trip. They are included them to show a little more of the diversity of Centennial Trail. Great trip and report. I noticed the same thing about the sun on a recent trip to Montana. I never would have guessed that the sun would be a factor compared to South Carolina. I suppose its the elevation, lack of clouds and lack of humidity. Thanks for posting! Great write up I used to live up there back then the Michelson was still under construction. Some day I need to get back up there and do a loop like this. Coming from AZ I don’t think the sun will be an issue. Being from AZ cant hurt but..
I’m curious. When you were below the dam and the trail gave out, were you able to navigate your way out by listening for the faint sounds of the PA Turnpike? For anyone going to the BH and wanting a separate ‘few hour ride’: do not miss Breezy Point trail. Only a few miles long (a loop) but super flowy and with tons of fun rock rolls/drops. Great write up! This trip seems much more planned out than the classic map rides of the Laurels Mtns, shapefiles and everyting, plus online maps. Good to see such posts. Include more details about the Deadwood ‘working women.’ Cheers. I ran across a nice article in a magazine about bikepacking. I figured I’d google the term and viola! You still racking up the miles? Thanks for the Write up! 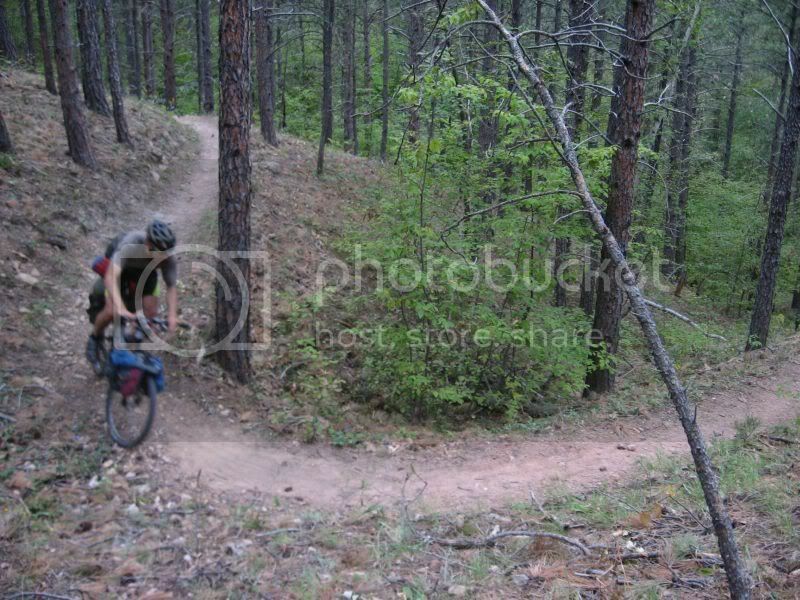 I go ride day trips on this trail but you are the first one that I have seen put a trip report on this trail. This is some great riding and gives me the cabin fever dreams to head to the hills to do this route once the snow is all melted. Great write up.. and pictures. enjoyed them. We live in Nebraska right now, but have a home in the BH and do a lot of hiking up there every time we get there. We love it. Can’t wait to get up there to hike full time. Might start riding, but just not sure we can handle all that. I notice the elevation more being from Nebraska and a mere 903′ but my husband is from Wyoming, so he doesn’t mind it at all. There are so many places up there to hike, ride and just get away from it all. There are a lot of people on some of the more refined trails, but if you want, you can find some where you are the only one for miles around. Thanks for sharing!